Dysgraphia is a neurological condition that impairs writing and memory processing. It belongs to the same family of learning differences as dyslexia, dyspraxia and dyscalculia. Dysgraphia is a condition that causes problems with written expression. For many children with dysgraphia, holding a pencil and organising letters on a line are difficult. They may also struggle with spelling, and with processing their thoughts and writing them down. They are frequently articulate and lively contributors to discussion but will avoid putting pen to paper. How do I know if I have Dysgraphia? The diagnosis of dysgraphia is difficult to make: many people have handwriting difficulties. Diagnosis has to be via an educational psychologist or a SpLD Assessor in the UK, and because it is a rare condition, it is sometimes hard to find a person who feels confident in their skills in assessing people with this condition. This difficulty is more than simply "untidy" writing; it affects peoples’ ability to write effortlessly. The act of handwriting demands a complex set of fine motor skills which have to be co-ordinated with information processing. Many people with dysgraphia are able to write, but this requires a higher than usual degree of concentration and working memory. Written work is often very poorly formed, difficult to read, a mixture of cursive and block letters, not on the line, with letters of varying sizes and not presented according to convention (for example work may be right hand justified, rather than left hand justified). Dysgraphia can sometimes cause physical pain and often limits a person’s ability to express their thoughts when writing, which makes it difficult for people to achieve their potential. 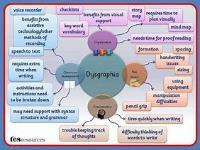 Dysgraphia is a recognised learning difference. Does your child have spider writing with letters of all shapes and sizes, appearing above and below the line, some joined-up, some printed with a random mixture of CApitAl and loWer-caSE letters? Do they avoid writing or tire easily when writing? Are they unwilling or unable to copy from the board? Do they have an awkward or tense pencil grip? Is their work littered with spelling mistakes? At school, a teacher might tell a child that their homework has not been given the time, thought or attention it deserves. The teacher may struggle to understand how a child who is able to demonstrate extremely good understanding and fast thinking verbally, produces such untidy and poorly structured work. Dysgraphia exists independently of good or poor teaching and the skills of writing by hand are largely not amenable to "better input" by the teacher, parent or the child. It is entirely unfair to put someone with dysgraphia through an intensive handwriting course designed for children who have poor motivation or who have had poor teaching. Directionally challenged: may confuse left/right, over/under etc. Many also have dyspraxia and associated difficulties with directions, spatial awareness and arranging letters or numbers in order.